Haciendas are to Mexico what castles are to Spain. They're unique and in their quiet, serene beauty a bit romantic. Karen Witynski and Joe P. Carr, sensitive to the charm of old haciendas and their influence on contemporary design, take their readers behind the scenes as they open the doors to Mexico's haciendas to reveal antiques, artifacts and creative interiors. Originally built in from the 16th to the 19th centuries to grow sugar, henequen, coffee and wheat and to mine silver and produce mescal, many of Mexico's haciendas have been transformed into country homes, resorts, and art centers. 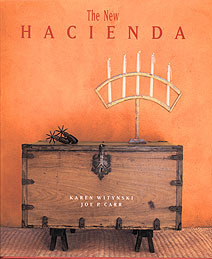 Witynski and Carr introduce their readers to the romantic world of old haciendas through intriguing text and spectacular photographs. Beginning with the origins of these old haciendas, they discuss the different types, their furnishings, architectural elements, restorations, and their influence on contemporary design, the basic concept of their book. In their chapter on hacienda kitchens, they even offer a few traditional recipes. The authors show how the use of natural materials like stone, wood and brick lives on in the design of today's interiors. Their book shows how designers and architects have found inspiration in the old haciendas, as well as how they've integrated Mexican elements into new home on both sides of the border. Both lovers of Mexican culture and art, as well as contemporary design, will cherish this book. It's one to keep on the shelf to read again and again. Plus, the Resource section is particularly helpful for anyone interested in restoring or building a hacienda-type home.